Several years ago I came across a list of story plots on the website of the Tennessee Screenwriters Association. In preparing for this post, I searched again on the website and was unable to locate the list. 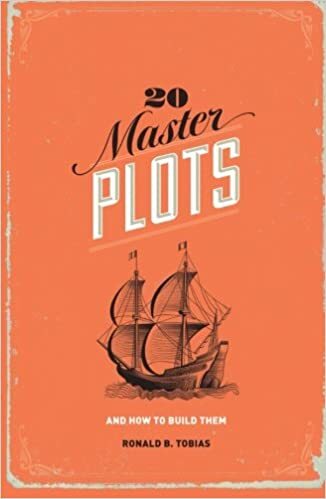 However, I discovered that the list was likely put together from the book 20 Master Plots and How to Build Them by Ronald Tobias. In the book, Tobias discusses the nuances of each plot and how to create plots for any subject matter. You will recognize these time-tested plots in television shows, movies, and books. Prior to addressing each of the 20 plots, Tobias lays a solid foundation by defining plot. According to him, "Plot is a chain of cause-and-effect relationships that constantly create a pattern of unified action and behavior." A plot is a series of connected events that typically include an inciting incident, a series of reversals, a climax, and a logical ending which ties the events together. While a story is a sequence of events (this happened and then this happened), a plot includes events that cause tension that builds throughout the narrative (this happened but then this happened). It is this subtle difference that keeps plot-based narrative compelling. Inciting Incident: Something must occur that gets the main character, the protagonist out of the normal, everyday world and into the adventure. Complications: Someone, the antagonist, wants something that conflicts with what the protagonist wants and seeks to prevent the protagonist from achieving goals. Crisis: The protagonist gets to a point a choice must be made between various courses of action (retreat, continue, etc.). Resolution: The protagonist reaps the consequences of the choice made. I like Coyne's structure, and I believe it can be applied to any of the plots below. These five steps and ten plots are suitable for large works of fiction, short stories, anecdotes, and dinner conversations. If you think about a situation from work, could you adapt it into one of these plot patterns? Can you outline the narrative using the list above? Rather than telling a basic sequence of events, think about it in terms of conflict and tension. Audiences keep watching reality television shows because they want to see the conflict between contestants and learn what will happen next. Quest: plot involves the protagonist’s search for a person, place, or thing, tangible or intangible, but must be quantifiable. Adventure: involves the protagonist going in search of their fortune, and since fortune is never found at home, the protagonist goes to search for somewhere over the rainbow. Pursuit: this plot literally involves hide-and-seek, one person chasing another. Rescue: involves the protagonist searching for someone or something, usually consisting of three main characters (protagonist, antagonist, victim). Escape: involves a protagonist confined against their will who wants to escape (does not include escape from personal demons). Revenge: retaliation by protagonist or antagonist again the other for real or imagined injury. Riddle: involves the protagonist’s search for clues to find the hidden meaning of something in question that is deliberately enigmatic or ambiguous. Rivalry: involves the protagonist competing for the same object or goal as another person (their rival). Underdog: involves a protagonist who is at a great disadvantage and is faced with overwhelming odds competing for an object or goal. Temptation: involves a protagonist that for one reason or another is induced or persuaded to do something that is unwise, wrong, or immoral. I will share plots 11-20 in another post.